It's about the time of year in which I could really use a little recess. How about you? The other day, during my semi-regular interweb check of what is out there in the piano world, I typed the word "piano" into my search box. I was going to type "piano blog" but the helpful suggestor had various ideas, the first of which was "piano games" and I thought, What The Heck, and clicked on it. The first site was a place called pianogames.org which features several fun little games to play. Not too surprisingly, they are heavy on the game aspect and light on the actually having anything to do with music aspect. In other words, you don't really need to know anything and you aren't going to learn. But I have observed that very same observation previously on a very old page on pianonoise in which I had linked to some musical games from various places. One of those places was a website belonging to a French fellow who had created some cool video games which, however, do actually require some musical knowledge of the beginner variety: one game that involves reading notes on a staff and another that involves rhythmic recognition. Both have things like falling bombs, limited numbers of lives, scoring, and, of course, shooting things, so they are the perfect marriage of video game and music education. These were not. I had some fun playing the game in which you try to avoid pianos being dropped on you. That has to be a seriously expensive game. Even a used grand piano usually costs around $10,000. I must have gone through a million dollars worth of pianos, and I only played for a few minutes. I didn't last more than about 5 seconds on their "difficult" level. I better hope I'm never in a situation like that in real life. Some of the others were not really what you'd call 'games.' The one that said you could "play some classical music to impress your friends" (why else would anyone want to bother with classical music?) was simply a piano keyboard on which you could click on notes and play melodies, or whatever vaguely melodic thing you had in mind. The keyboard consists of alternating white and black keys so recognizing actual note positions on an actual piano does no good. It's kind of like an actual guitarist trying to play guitar hero--forget what you know and just hit things. Another game that I did not play said that you could became "a musical artist in an instant." Oddly enough that didn't appeal to me because I already am one. My only concern is I will have to share with all the people playing that game, and life is competitive enough. Oh, well. There is another game in which I could "win the heart of a girl by playing the piano in a romantic way." I'll have to give that one a try. After all, our tenth wedding anniversary is coming up. Before I say farewell to Schumann's Kinderscenen, or the concert on which I played it, I would like to point out one more fascinating feature about the set of 13 pieces, one more reason that they all seem like they belong to the same set of pieces. You get the idea. I'm not finished yet. And neither was Schumann. For those who are not proficient in theory-ese, a V7 chord is the kind of chord that introduces musical tension that must be resolved. It is a tiny little "whodunit" in music, setting up a question that can only be answered by the chord that follows. Also, if you are a musician, and someone walks by a piano and plays a V7 chord without resolving it, it can drive you crazy. Once, when I was in grad school, I walked into class, past the piano and played said V7 chord without resolving it, just to observe my fellow student's reactions. It did really get to some of the them. So I went back to the piano and played a new chord which, while resolving the chord, did not do what they expected (for theorists: I redefined the V7 chord as a German augmented sixth chord and resolved it accordingly). I was really hilarious in music school. It's a wonder I didn't get a piano dropped on me. I'll drive my point home by leaving you with the complete fourth piece from the set, which, as I mentioned, ends on a completely unresolved chord. If you wish to be put out of your misery and continue on to the fifth piece, might I recommend going to the music archives here (it'll take you right to the Schumann) and listening to said fifth piece. You can do a similar experiment with the last two pieces, stopping the play button for at least ten seconds to get the feeling of not being musically gratified. Once you can't take it anymore, hit the play button on the last piece. How can a person run 20 miles and have a marathon cancelled without being able to finish? How can that same person write a blog post, then for no known reason (besides hitting the backspace) that post is suddenly replaced in its entirety by the text of a completely different blog post and instantly saved on top of it, thus completely deleting said blog post that took so long to write in the first place? It's a relatively minor problem on planet earth, really. Anyhow, I'll get over it, and I'll rewrite the post I had planned for today--in a couple of weeks, when I have time to do it. I'm picking on my pedestrian home town newspaper again when I choose this blog's title, which seemed to be their favorite way to describe everything that ever happened in our little hamlet, but I think it is fair to say that nearly everybody at last week's gathering in my current home town had a pretty good time. Everybody I talked to. And that includes myself. It seems to have been a while since my last live concert (In October). I've been doing a lot of recording, lately, and as always befits a musician, practicing in isolation. But it really struck home how much fun it can be at a live concert. 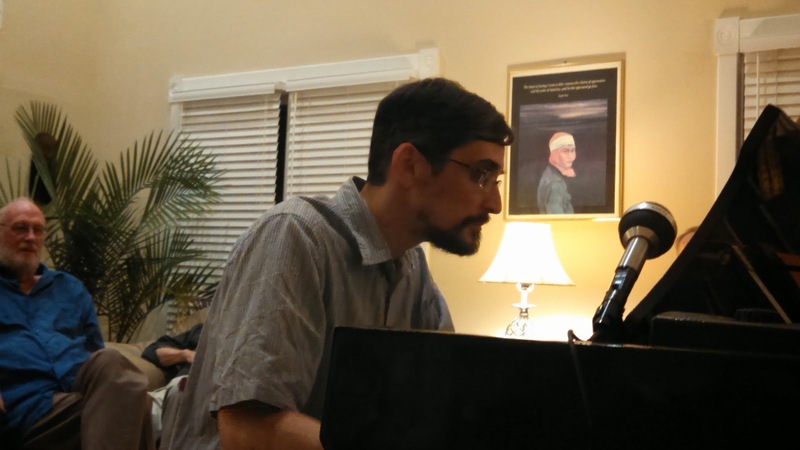 Last Friday, at a house in Urbana, I was said live concert. 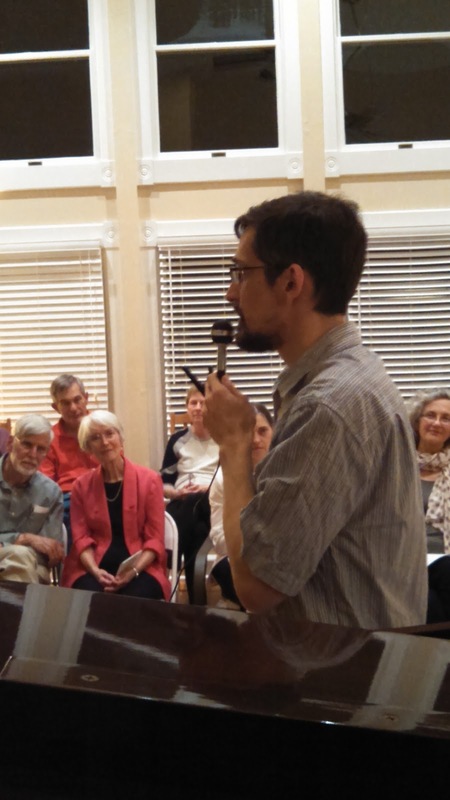 As I mentioned last week, I don't think I've given a house concert in about 15 years. It is interesting what one can do in such an intimate setting. 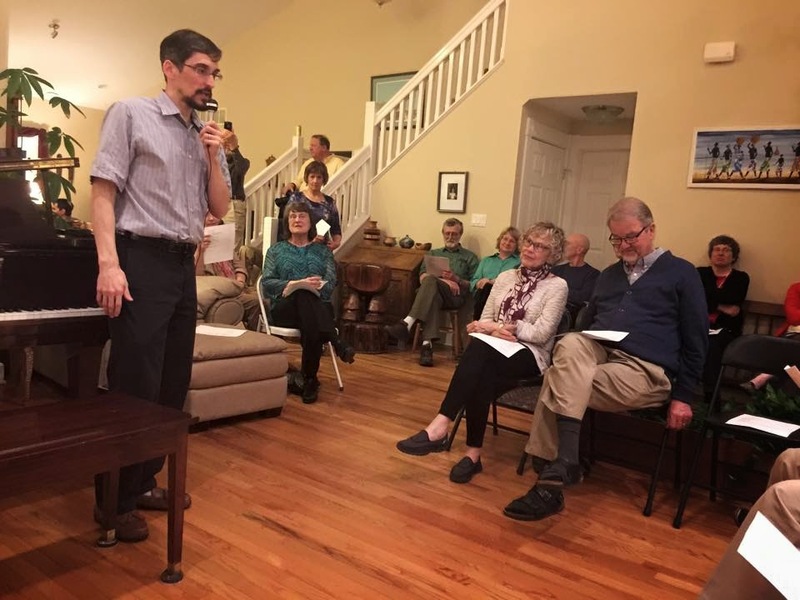 Around 50 persons managed to fit comfortably in the large living-room area, complete with bar, food and drinks, and plenty of time to socialize before the concert. Then I started in with a couple of selections by Rameau. The first turned out to be a duet for piano and lawnmower (you never know when your neighbors are going to cut the grass) and in the second, which was a representation of birds, some real ones piped up outside, which was a delightful effect. 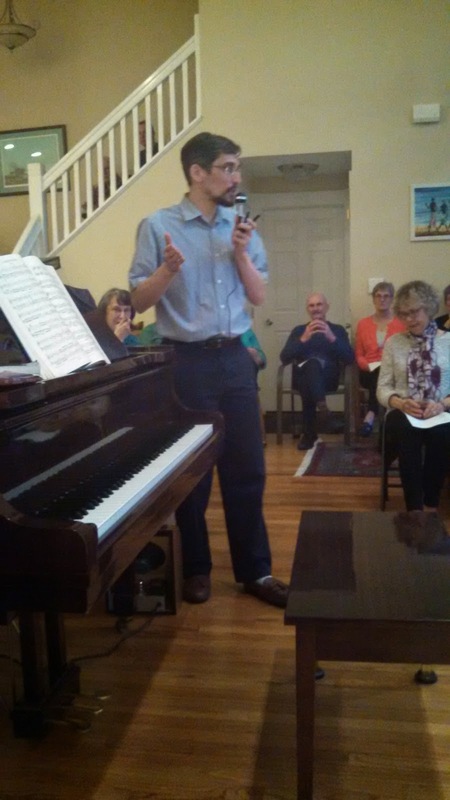 My impresario had reminded everyone not to get drinks in the middle of the selections--this first set functioned much like the classical piano recital it essentially was, and the music was of a serious and profound variety. 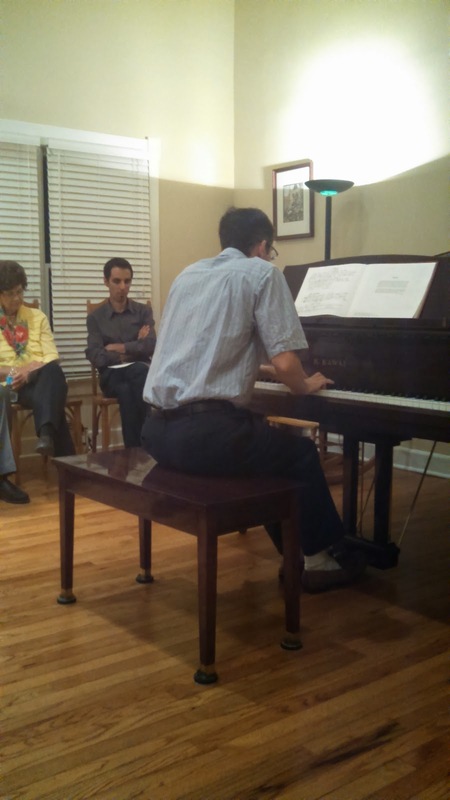 I continued with a set by Schumann, uninterrupted by commentary. This, I forgot to inform my listeners, was the most beautiful part of the concert, so if they came for artistic transport, they needed to do it now. Then things took a turn for the "worse." I told the audience, to whom I had been talking between selections, that we were going to go directly from the sublime to the ridiculous. Kotzwara's "Battle of Prague" served admirably, and included one of the most interesting portions of the evening, the sing-along. 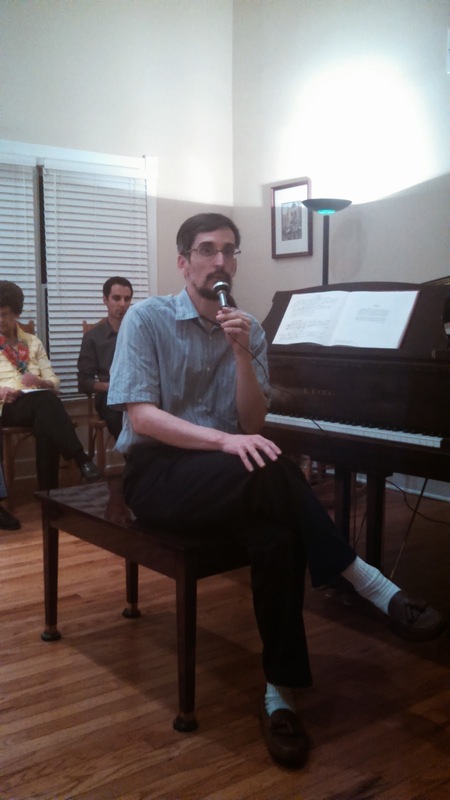 I don't know if you've ever been to a sing-along at a classical recital. Then again, you've probably never heard "The Battle of Prague" played at one, either. I had mentioned to the audience that even though the actual battle had taken place between the Austrians and the Prussians in 1757, that the composer had managed to smuggle in the British national anthem for, of course, sound commercial reasons (i.e., the Brits were the ones buying the music). I then wondered whether the kids playing the music felt the need to stand when they got to that part. Having set up the joke, I stood to play that section. 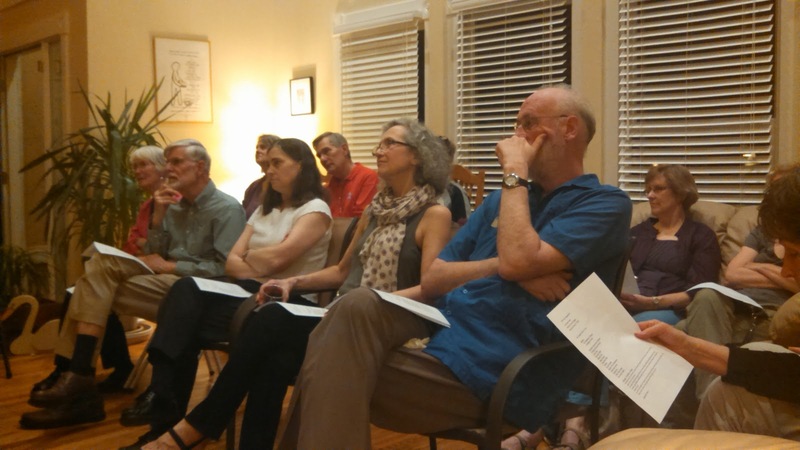 Several audience members stood as well, and then they began to sing! I had to shout over the din that for God-only-knows-what reason, Kotzwara chose to repeat each half of the piece. But, despite a bit of confusion, the chaos proceeded delightfully apace. We were all flush with enthusiasm at the intermission. 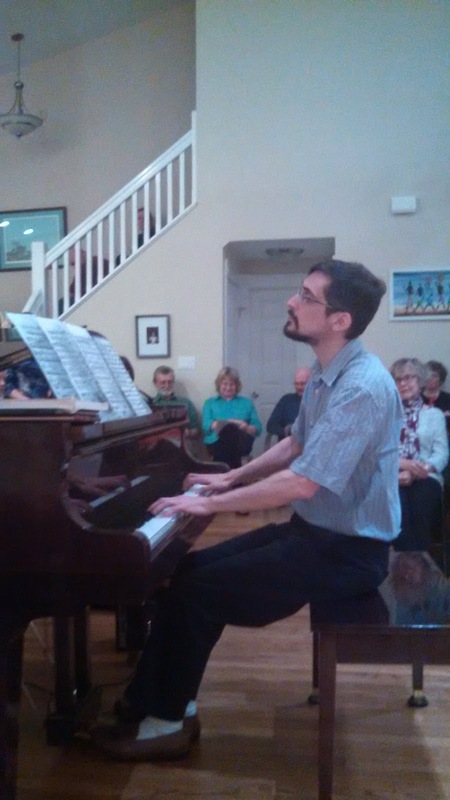 The second half began where the first left off, with a set of silly little pieces by Erik Satie which were so short that, unlike the Schumann set, which I had played without interruption, I was able to break the musical spell and talk about a piece or two whenever I felt like I had something to say. At one point I announced that both the Schumann and the Satie collections had musical settings of "blind man's bluff" and, playing each in turn, asked for a vote to see which the audience liked the best. The Satie won, but Mr. Schumann had some adherents. Having begun formally, the concert spent 2/3 of its length becoming more and more relaxed, and the audience had no trouble laughing during portions of the "Crush Collision March" at the end, unafraid of breaking recital taboos. 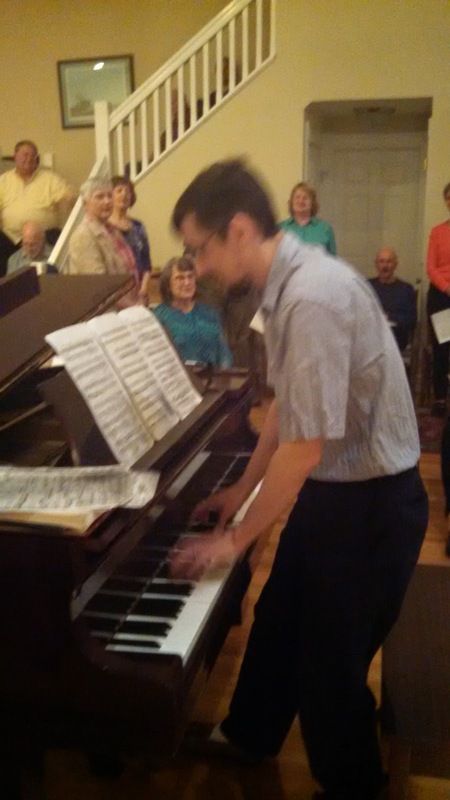 At the end, after one more Joplin rag, I was asked to improvise an encore, and the evening came to an end. We're going to do some musical rubbernecking today. A young fellow named Scott Joplin needed a way to generate some interest in his first publication. So he chose to title his piece after a recent bit of sensational news involving two trains and a lot of spectacular property damage. What he created from this real life destruction can be described as a musical train wreck. Actually, it is a pretty harmless little march, with a sonic representation of the train wreck itself in the last section. Now before we get there, there are three things to note about it. First of all, you'll have to wait a few minutes for the collision itself, because, being a true march, it consists of a first strain, that repeated, a second section, that also repeated, and then we get to the trio. This is the part of another march--"Stars and Strips Forever"-- that has been given words (Be kind to your web footed friend, etc.). That trio then has a "complicating incident" in which the low brass instruments go at it, complete with tense and dramatic harmonies, until we come out the other side and the trio melody sings again. That's the same part of the piece in which Joplin has his train wreck. The second thing to know about it, before we get there, is that it's pretty wimpy. Not only is it not very disruptive (except, perhaps, for being in the bass, which gives it some rumble) but it even connects smoothly with what follows. Ah, yes. What comes next. That's item number three. Now, if you listen to the aftermath of the train wreck, you'll note that the chipper little melody comes roaring right back. We all just had a really great time watching all those people die in that terrible locomotive disaster. Except that I did some more research and found out not to feel guilty about it. You shouldn't either. True, Joplin's piece is actually based on a real collision between two trains that happened in 1896. But it was a staged collision. That's right, people needed something fun to do, and the idea of slamming a lot of stuff together at high speed held a lot of mass appeal even then. In the days before monster truck rallies, or action movies (or Hadron colliders) this apparently was pretty entertaining. We are assuming, of course, that the engineers managed to jump out before the collision and that nobody got hurt. Oh, one more item. Because in a march everything gets repeated, you'll hear the collision part twice. This is before they had instant replay, or super-slo-mo, or reverse angles, or any of that, so Joplin's audience might have considered this to be a real privilege. It could even be an indication that Joplin was ahead of his time. But not really. He was just doing what the march form required. Tonight I'm giving a concert at a house in Urbana. It has been a while since I have played a concert in someone's house. In fact, I couldn't remember ever doing it before except when I was preparing an audition for graduate school and played two test runs at my parent's house (my piano was staying there at the time!). Then I remembered a concert from 2000. It was a concert series at a plantation house in North Carolina. I don't know how the connections where established, but apparently the Chair of the voice department at Peabody had sung on what was a yearly concert series there, and she's no slouch (having met most of the important composers of the 20th century and premiered many of their works, I'd say not). 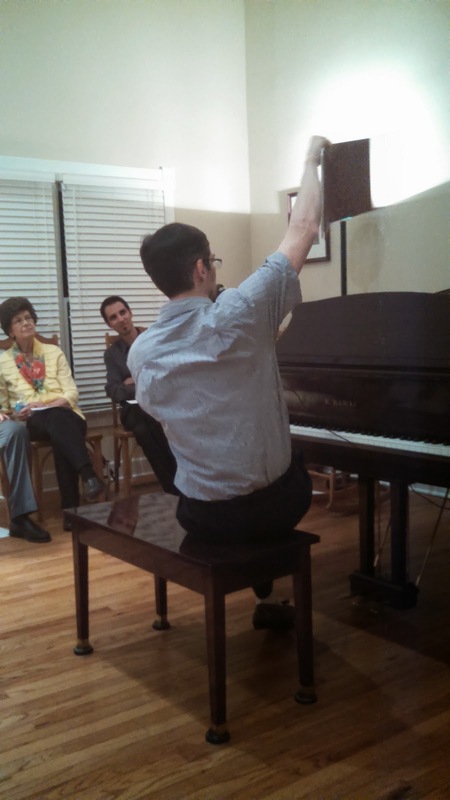 A student of hers (also no slouch) was contracted to sing, and I was to play the piano. There are two things I remember about the event. One was that there were hurricane-force winds on the trip down and driving rain. I was driving, and the several hour trip from Baltimore to what seemed like the middle of nowhere looked at lot like what you see on the news. The trees were bent sideways, visibility was tough--I was a little concerned. When we got there, to a solitary house in the middle of nothing but rolling fields, I didn't know what to expect. But it's a house, right? Not a concert facility. Upon arrival on the porch of this weather-beaten house which must have been a hundred miles from any large town, I could hear the sound of a piano. I peered in the window and imagine my shock to see a man bent over it tuning a 9-foot Steinway concert grand! Evidently it was on rental from a music store in the area. Wow. Now you have to realize that when you give a concert in someone's living room it isn't going to be like playing Carnegie Hall. But here's the irony: I had just played Carnegie Hall a couple of months earlier, and I have to say, the piano in that fellow's living room was a better piano! The one in New York was functional, but it didn't have the tonal character that this one did. I should mention that I spent a certain amount of time in New York in those days, and the pianos always seemed like they had seen an awful lot of action (which they did, of course). 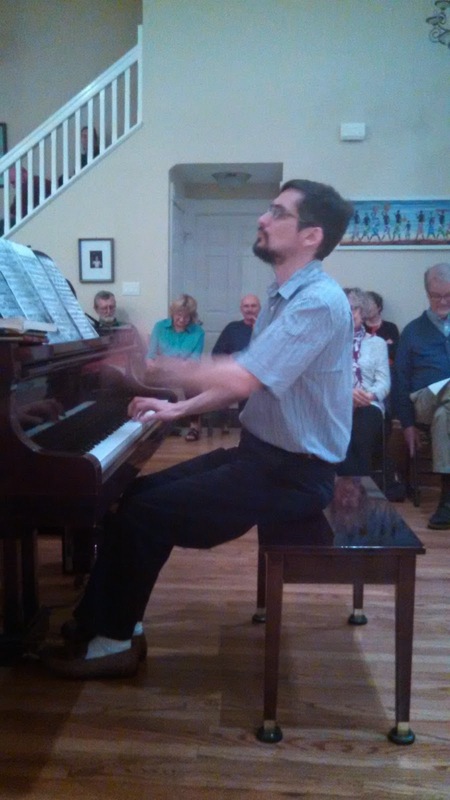 The piano in North Carolina, by contrast, has to be one of the top five pianos I have ever been privileged to play. And it was in a living room in a rural house. Not where you'd expect! Tonight's concert does not feature a 9-foot Steinway. In fact, it spent much of its life in a church where it was probably not cared for properly. As a result the dampers do not close around the strings fully in some instances. This makes for a very interesting effect, however, in that, by depressing the pedal part of the way, you can call forth a somewhat metallic, harpsichord-ish sound from the piano, which I intend to exploit, since I'm going to start the concert with a couple of pieces that were written for the harpsichord. There are also some cool overtones that ring prominently when you strike a chord in the bass with some force--I'll see what I can do with that. I predict that the train crash in Joplin's "Crush Collision March"* will sound really awesome! Each piano has its own character, and its own challenges. Some fight back, others are very light. The action on tonight's piano is of the second variety, which is an advantage for some of the music I've chosen to play. The room also has a high ceiling which gives more reverberation than is typical of a living room setting! But the best part is the intimacy. I'll be in close quarters (no boundaries between the stage and the audience) with friends and friends of friends who have just enjoyed good food and are settling in for a fine musical conversation. I should do this more often! *I'll blog about Mr. Joplin's piece next week. Only the rhythm has been changed to protect the innocent (there's no dotted snap on the descent). All of these moments are connected. But what effect do they have on the listener? One of the major problems we pointed to when it comes to music with a program is that it can sound like a lot of disconnected episodes. It might be good at establishing imaginative connections with the world outside the notes (depending on your imagination) but it lacks internal cohesion. That isn't a problem for Robert Schumann. His "Kinderscenen" is a collection of 13 short pieces which, somehow, sound as if they really belong together. This little musical idea shows up in at least 20 places. First we hear it near the beginning of the set, in the second half of the very first piece. I said finally, but it is present in many other places as well. Beside the first four notes of the final piece, there are subtler versions of the motive in pieces like "knight of the hobby horse" and "suddenly too serious"--the first of these has additional notes interpolated, and the last is stuck in the middle of a long phrase so you aren't likely to notice it. Once you start finding connections like these it is hard to stop. That's partly because there are so many of them. And, for the skeptics among us, the ones who raise their hands and ask "sure, but it's only four notes. Couldn't you almost stick it in there just by accident? Isn't it like making a big deal out of how many times a great novelist uses the word 'the?'" Good point. But look at the motive again. It's not as simple as the musical version of good morning. You have to make some effort to use it. Also look at the number of strategic places in the music where Schumann gives it center stage. That's my test for intentional use of a motive. As I said, Schumann had a gift for connectivity. And when you have that gift, there are times when it may indeed "happen by accident"--when you put it on the page first, and realize it afterwards. That is the role of inspiration, and the subconscious. But it doesn't happen to everybody, and it doesn't happen without some attempt to think that way in the first place. Just ask Frantisek Kotzwara. A while back I was reviewing the pianonoise listening archive and noticed there were practically no compositions by women. This is not an easy bias to correct, however. Most of musical history has been dominated by men, as in every professional field. Until the last century there have really been only a handful of women given enough opportunity to make any sort of mark, and often their compositions are pretty slight. This does not excuse the assertion of men that there could never be a female Beethoven because women just aren't up to it. That's nonsense. But it happens to require the talents of many individuals over a great deal of time and with the encouragement of the society around them to allow even one great musical mind to develop, and a mere fistful of persons allowed to practice in a field, and then only privately, or until they married, is not very promising as a condition to produce a great practitioner. Even so, there have been some notable women composers. Perhaps no great ones, but at least as gifted as the scores of lesser male talents who were contemporaries of the men who gut busts made of them to adorn our pianos. And, once society is determined to stunt one gender's compositional growth so aggressively, can we really be sure that one of them couldn't have been great, given the chance? By the 20th century, some of them were fighting for a chance. And here we see what prejudice is really made of. It's not rational, though that is exactly what it claims to be. One woman was finally given a chance to study at the prestigious Leipzig conservatory. Some of her works were shown to Brahms. Brahms was impressed. At the same time, he was quite sure that she couldn't have written them, because he was quite sure that no woman could write compositions of such quality. Then publishers refused to publish her because, after all, there wasn't much of a market for her works--obviously, no one was interested in her stuff. Did it occur to them that that wouldn't happen unless they published her music? she asked. I imagine she was rather irritated by this point, but if she had shown it, well, you know how that would have gone down. Just like a woman, all emotional and no head on her shoulders. yukyukyuk. That woman's name was Ethel Smyth, and this week I'll be playing a chorale prelude of hers. It will join the pianonoise catalog next to the only other woman on the page, Evelyn Stell, an organist living in Scotland. This piece is fairly short, and I don't expect it to impress the average listener, but it shows she had a high command of counterpoint and compositional technique. Smyth's handful of chorale preludes for the organ are not flashy, but there is a good reason Brahms would have been impressed by them--they are not dissimilar, either in approach, or, frankly, in quality. It may be just me, but I rather imagine other organists reading this would have a similar experience. Sure, I am up and around this week, alive and well and practicing, but it does seem to take at least a week to really clear up the fog in my head after a major church holiday. It's not easy to pick up and keep on keeping on after an expenditure of energy like Easter. A couple of years ago I even blogged about a couple of famous organists who died right after major holidays and hoped dramatically that it would not be my lot. Sure, Marcel Dupre was already old when he kicked off Pentecost afternoon after the service, but Pierre Cochereau hadn't arrived at 60 when he died of a brain hemorrhage two days after Easter. I've no plans to shuffle off this mortal coil, and by comparison I feel just fine, thanks. Just....really tired. But next week starts with a Sunday, too. And they come fast. And to make it worse, few people will be in church. This past weekend Faith had nearly a thousand worshippers. This coming week, I'll bet it will be somewhere in the low 200s. (On an average Sunday we have around 400). After you've been to the mountaintop, it's hard to just pick up and do it again. It's hard not to want a little rest. And while many in our Faith family will be getting just that, sleeping in and what-not, I'll be back at the organ, and the piano, and the keyboard, doing what I do every week. Being consistent. Which is easier if you are consistently dull, or consistently simple, or consistently not conscientious. It is tougher when you've put the pedal to the floor one week, pulled out the stops, thrown a party, played twelve verses of Christ the Lord is Risen today to raise the roof and blasted the Widor Toccata twice at the end of a service filled with loud music and celebration. Gosh, how many notes did I play that morning? How many did I leave on the floor? Fortunately, I recorded it before Easter, when I wasn't even sure when I'd be playing it. Now all I have to do is find enough energy to proclaim it to the congregation on Sunday. I sure don't feel like it right now. But it's only Wednesday. When Robert Schumann was asked about the meaning of a particular piece he had written, he simply sat down and played it again. So the story goes. The music meant itself. Like most slogans in a war, it is oversimplified, and admits very little variation. Or the truth. After all, sometime either before or after the alleged incident, that same Mr. Schumann wrote several sets of pieces with titles suggesting that the music did point to something other than itself. Either the inspiration for, or the suggestion of, the music, was taken from life, and life, astonishingly, is not completely reducible to musical notes. Take a poem. While reading it, several images, sensory perceptions, and narrative details may float through your mind, connections to other poems, which in turn conjure their own set of ideas and concepts. That doesn't mean that the words in the page make no matter, or that you should spend the entire poem daydreaming about that vacation you took to the beach in Florida whilst completely leaving the actual content of the poem itself behind in your reverie. The words themselves, the play of the sounds, the intriguing constructions, syllables, emphases, peculiar line breaks or word inversions, repetition of images, or consonants--all of that matters, just as the musical notes matter. At the same time, they point to something else. That doesn't strike me as being unfathomable. But there was an ideological war on in 19th century Germany, so everyone had to take a side. Music-drama (as espoused by Wagner) or absolute music, with Schumann and later Brahms as hero. What a silly lot we are. Next Friday I am including on my program Schumann's "Kinderscenen"--usually translated "Scenes from Childhood" though that isn't necessarily what the term means exactly (literally "child-scenes?"). Each of the pieces bears a title suggesting an image or activity one may have experienced in childhood "curious story," "important event," "knight of the hobby horse," "dreaming." Our good Wikipedia says that the titles were actually put on the pieces after their composition, which is curious. It could tell us not to be too caught up in the imagery, since Schumann was apparently not thinking of the idea or image at the time of composition. On the other hand, if the pieces, when finished, suggested those ideas to the composer, then perhaps they ought to suggest those ideas to us as well. I should point out that it is just that "tyranny of ideas" that caused some people to protest against program music (Schumann included?). Why can't I substitute my own ideas? Why do I have to imagine what the composer wants me to imagine? But then why daydream at all? We've already experienced some of the worst of what happens when one reduces music to something else--cannon shots and trumpet calls, all impeccably labeled for those who couldn't figure it out on their own (see last week's installment). Is it better to be more subtle about it? One thinks of Debussy, who wished his printer to put the titles of the pieces after each prelude rather than at the top of the first page. Play the music, then I'll tell you what I was thinking. Then there are the wide swaths of people who assure us that music is strongest and best at suggesting emotion. Thus, the impressions of, or emotions connected with something, rather than the thing itself. Not the story, but the way we should feel about the story. Think movie music. What is the function of the film score if not to direct you to feel a certain way about the events happening on screen, or at least to affirm them (after all, if you've been to a certain number of movies you know when to expect the heroic C major blast when the good guy finally breaks through and achieves victory). Like Satie's pieces (a few weeks ago we discussed "Sports and Recreations") these pieces are short; little cameos with a lot to say. And they have an interesting compositional history. Again from the almighty Wikipedia: evidently Mr. Schumann needed a couple of months to get these pieces written. This is frequently a surprise to people who think composers are somehow always operating in real time, and can't fathom how a piece 30 seconds long might take all day to write. It may also surprise persons who know Schumann's habit of sketching an entire symphony in just a few days. What seems to have taken the longest was the ultimate order of the pieces, as well as their selection. It wasn't that Schumann had a problem with fecundity--he wrote some 30 pieces. But only 13 made the final cut. And listening to the set now, perfectly chiseled, and forming such a beautiful chain of continuity and variety, it is hard to notice any struggle at all, so well did he succeed. Well it's Holy Week, and I'm a church organist, so what do you suppose I've been doing all week. Preparing for Easter services? You'd be wrong about that. Mostly. I like to prepare pieces I'm going to play with plenty of lead time since it is time that allows from the greatest familiarity and comfort in performances. Therefore, I am likely to work the hardest on the piece or pieces I will be playing the following week, which is how I spent much of my time. Oh, I sketched my improvised introduction to the opening hymn on Wednesday, and I also dusted off the Widor Toccata yesterday. That didn't take much time since I've been playing it for over a decade. I play it in church once a year, on Easter, and occasionally for weddings and funerals by request. I spent as much time setting the pistons (which thanks to the organ's new memory capacity I will never have to set again!) as playing the piece, the bulk of which turns out to still be memorized, which is handy if you have no limbs free to turn pages and don't wish to commandeer a page turner. Knowing that I could probably pull these elements together in a short amount of time, I spent the first portion of the week learning something new. This is always uncomfortable at first. In the beginning I tended to miss a lot of pedal notes, since there was not only a fair amount of coordination between the limbs to be gotten used to, the pedal was largely on the far right of the pedal board so I was feeling a bit off balance. By the second day I was starting to feel less clumsy about the whole operation. And then on the third, a miracle happened. Perhaps I ought not overstate this. But I do find it really interesting that nearly every piece I can remember starting, if it is either fairly short, or uncomplicated, or at least if it is not a major work for organ lasting tens of pages (in which case it may take a couple of weeks), seems to come together in three days. Even back in college I remember the contents of pieces starting to rapidly affix themselves to my mind--become memorized, and familiar--on the third day of practice. It has happened so often now I look for it. I wonder if the ancients didn't notice patterns of this sort. One semester in college I noticed it rained every Thursday for a couple of months and wondered if weather patterns often tend to cycle in six or seven day increments with any regularity. It has happened many times since then (it snowed every Sunday during Advent one year) though there may be many unnoted exceptions. But why seven? Or six? Did anyone have a five day week back then? Or eight? That may seem to be the right length for a cycle of labor and leisure, but the number three has done far more duty. It is a magic number; it is a holy number; it is a convention in story telling, and it, too, sometimes has to be fudged. You'll note that so far I've left out the biggest three of them all, the one that occurs this weekend in the Christian calendar. On the third day, he rose again from the dead. The problem with that formulation is that people can't be counted on to preserve it exactly as stated. So it becomes, not "on the third day" but "in three days" or "three days later" which is not the same thing. That would have made Easter a Monday or Tuesday. Besides, picking a few nits, we observe that Christ died in the middle of the day on Friday, and rose before dawn on Sunday, which is really only a day and a half, which is considerably less than three. But three it is. As long as you include the day of death and count the day of resurrection, you can get three in there. Just like the sign of Jonah: "for as Jonah was three days in the belly of the whale, the son of man was three days in the belly of the earth." More or less. If you count it right. There is a bit of abstraction in there, and a looking for patterns. Sometimes we find them because we look. I should point out that while the piece I am working on seems to have come together on the third day, it is hardly ready for prime time. It will need another day or two before it can be aired on the first try amidst distractions and nerves. This third day is partially a sudden awareness of comfortability and the fulfillment of the promise of the first two day's work, but not a sign of completion. It is there, and yet it is not there. That is how mystical numbers and signs work anyhow. Part of it is given, and part of it is what we make of it. Today is the First of April, commonly known as April Fool's Day. It is also Rachmaninoff's birthday. That is a total coincidence. If you know anything about Rachmaninoff at all, you also realize how ironic it is. Of all the composers who never smiled, he smiled the least. It is hard to imagine him joking about anything, even if he did once look down upon a young Leon Fleisher who had expressed interest in a concert career and dead pan in his thick accent, "music----baaaaadd business." He may have been in total earnest, but at least it's funny the way Fleisher tells it. There is, however, another composer who practically no one ever accuses of being funny, one Johann Sebastian Bach. This, however, may be a mistake. Sure, he's not smiling in the portrait, but apparently family gatherings in the Bach family could be quite raucous. Besides, if you know anything about the history of April Fool's, or human nature, you know that pranks are not always of the completely harmless variety, nor are they quite malicion-free. And that just might describe what is happening here, in the piece I'm going to play for you. Why? Well, for starters the musical material ain't all that grand. Bach takes for his theme a simple scale, and this windy exercise drives the joke. Several times in the piece the two-voices chase each other around the scale like a pair of squirrels who can't figure out what direction to run in. The rest of the material is a slowly descending chromatic scale which does not sound very light-hearted at all. Some commentators have suggested that here Bach was responding to critics who were complaining that his music was too serious and did not have enough charm and crowd appeal. Taking light and flimsy materials with which to build the kind of artifice that they would not have appreciated in the least may have been a kind of musical back-handed slap. If that isn't enough to convince you, I've chosen a particularly hollow organ registration to drive the point home. It is missing its middle--a so-called "gapped" registration, in which the shiny mixture stops aren't sufficiently grounded with a full chorus of foundations. So if it also sounds a little odd aurally, that's why.